The faculty is approachable and helpful for personal, academic and professional matters. I study the role of tau protein in neuronal toxicity causing neurodegenerative diseases. Using cell culture, animal models, and human tissue from a variety of neurodegenerative diseases I am investigating one pathway to neuronal death and linking this to potential therapies for the treatment of disease. These studies will ultimately culminate in clinical trials potentially leading to the treatment of disease, but will also teach us about the ageing process in the brain, cellular stress responses, as well as differences between neuronal populations in the central nervous system. A thorough knowledge of the brain at the systems level, as well as molecular level is necessary for this research, as possible only through the neuroscience program. We are truly privileged to be graduate students here. The campus is beautiful, the people are friendly and helpful, and the research environment is energizing and world class. It is something to be proud of. I am part of a radio show called GradCast. 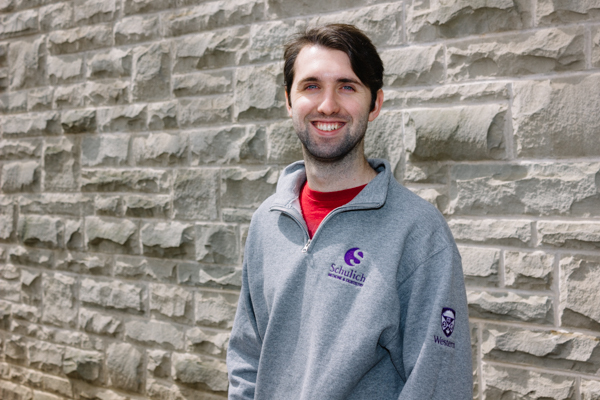 I am a member of the Schulich Graduate Students’ Council, a member of Making Waves, and a member of Let’s Talk Science. Research. It is truly thrilling to know that when I look through the microscope and see something for the first time, I am the first person in the world to know what I know. However big or small the finding turns out to be, for a moment in time, I am the only person who knows it. It is a thrilling thought, and one I have always dreamed of having. It is the closest thing I can think of to being a modern day explorer, blazing a trail through unchartered territory. I love animals. Except snakes. They scare me to death. Awakenings by Oliver Sacks. It is a mix of neuroscience and humanity that first showed me how beautiful both science and people are when combined. The PhD in Neuroscience is a research intensive program that emphasizes the development of individual scholarship and excellence through the collaborative interactions within this interdisciplinary program. Students in the program experience a very wide exposure to all aspects of neuroscience research from cellular molecular to cognitive neuroscience. Student with an MSc usually complete this program within 4 years. Direct entry into the program by students with a BSc is possible for outstanding candidates. PhD students are typically given a minimum annual stipend of $23,000 (or higher) which includes (pending eligibility) a Western Graduate Research Scholarship (WGRS) given directly toward the tuition amount; as well as a Teaching Assistantship, pending they have no external scholarship. The remainder is supplied by their supervisor grant account. At present, only candidates with a degree from recognized universities are admitted directly into the PhD program. All others interested in the PhD program are first admitted to the MSc program. They may transfer to the PhD program within the first 18 months, provided that their progress is excellent and that they have a project that could be developed into a PhD thesis.